Drayton Hall is well known as one of the earliest and finest examples of Georgian Palladian architecture in the United States. 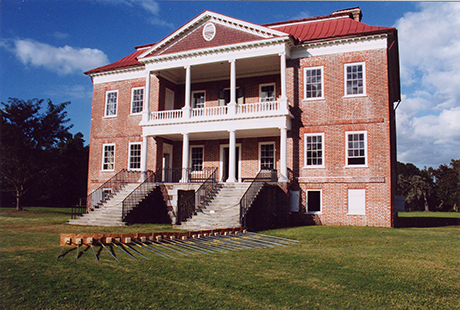 After the National Trust for Historic Preservation acquired the property from the Drayton family in 1974 a desire to open Drayton Hall to visitation necessitated an evaluation of the live load capacities of various structural systems throughout the house. In 1977, a structural analysis of the building identified several deficiencies including the ceiling framing of the Great Hall. The current Great Hall ceiling is the third ceiling in this space since 1738. Cracking, which is evident in the photograph, has been a problem for the ceiling for most of its history. In June 2002 after an extensive structural analysis, as well as design and installation of a structural retrofit to the floor above, remedial treatment to the detached areas of the ceiling was begun. Since it had been determined early in the assessment phase that treatment would not be required on the entire ceiling, the first phase of intervention involved identifying those locations where treatments were necessary. A final determination was not made until after a comprehensive interpretation of the condition of the ceiling using the results of the 1991 survey, the 2001-02 GIS analysis, an assessment of the 1978 treatment, and mechanical testing of the preferred adhesive formulations. 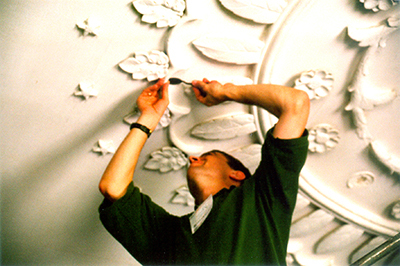 As part of the 2002-03 conservation program for the Great Hall ceiling at Drayton Hall, adhesive formulations developed by Morgan Phillips in the 1970s-80s were tested and used for plaster reattachment. The preference for an injection adhesive system was based on its specificity of installation (i.e., localized, minimum treatment) and low-impact on the historic fabric. This was all the more critical as earlier stabilization of the ceiling, following the practices of the day, limited access to the upper side of the lath and plaster, making retreatment difficult. Mechanical testing for tensile strength and, to a lesser extent, creep was performed on Phillips’ formulations. In addition to providing comparative data on tensile strength, creep, and modulus of elasticity, the tests revealed the unintended effects of the fillers and thickeners to mechanical strength. A view of the southwestern facade of the house looking north towards the Ashley River. The mansion has a recessed portico designed specifically for an extra set of doors to be added to allow a public entrance into John Drayton's office (right side first floor). 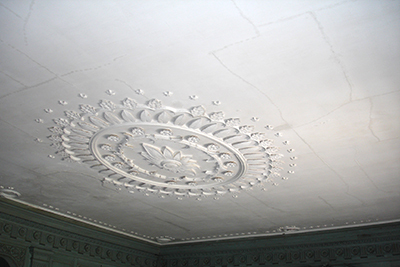 All elements of the ceiling were checked for stability including the decorative cast elements used in the central medallion.